Foreword by Sir Paul McCartney. 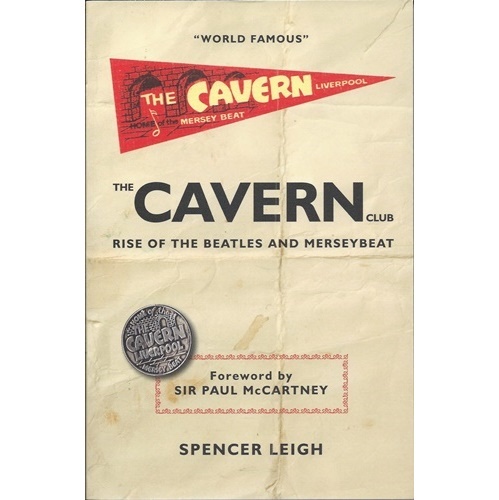 The official history of the Cavern, originally published in 2008 by SAF and now published in a new 2016 edition by McNidder and Grace. It is also available on Kindle. Over 300 performers and Cavern staff have been interviewed for the book and much original research is included in the text. An American jazz legend, Zoot Sims, headlined the evening session, while the Beatles played for what was to be their last time at Litherland Town Hall. Geoff Davies: “The modern jazz nights were always poorly attended and there were only about 30 people for Zoot Sims. He was one of those people whom I should have loved but I was not crazy about him that night.” So, all in all, a great day for the Beatles but a dreadful one for Ray McFall’s finances. The Beatles made their final appearance at the Cavern, bringing their total number of appearances to 275: no one is totally sure and it also depends on how you’re counting. Bob Wooler: “That August appearance only came about because Brian Epstein couldn’t pull them out of an appearance at the Grafton the night before. Les Ackerley said ‘I’ve got them under contract’, and Epstein was furious because, by then, he had other things in mind for them. He was calling Ackerley all sorts of names, but he didn’t use four-letter words as he never did that. Ackerley had a barring clause preventing the Beatles appearing in Liverpool before but not after that appearance, so Brian asked us to take the Beatles for the Cavern on the following night, which was a Saturday. I resented this as he was only doing it to get at Ackerley, and anyway, I had booked all the groups for Saturday 3 August. If I’d said no, he would have gone to Ray McFall, who would have said, ‘Of course we’ll take them.’ The Beatles were paid £300, which was quite a bit of money then, and Brian restricted the audience to 500. I can’t blame Brian as he had seen how crowded the Cavern got and he had to think of the Beatles’ safety. The admission price was 10 shillings and so that meant that we collected only £250 on the door. All the staff had to be paid, and the other groups on the bill too, so we made no profit that night.” Wooler is mistaken as the Grafton concert was for Albert Kinder, but the fee of £100 for August 2 was agreed on 14 January, 1963. Get back to where you once belonged. Paul McCartney announced his show at the Cavern on ITV’s Parkinson on December 3. “I am going back for just one night as a nod to the music that has always and will ever thrill me. I can’t think of a better way to rock out the end of the century than with a rock’n’roll party at the Cavern.” Soon it was being touted as the gig of the century. The rehearsals in the afternoon were in front of about ten people. There was Bill Heckle, David Moores and Neil Aspinall. David and Neil thought that they did not know each other, but they did as David Moores ran the sixth form entertainment when he was at Stowe, and had persuaded his father to book the Beatles in April 1963. Bill Heckle: “We told Paul that Bob Wooler was over the road and he said, ‘Bring him over’, as he would love to see him again. He was in the Grapes with Ray McFall, and they came over and they met up. Paul gave Bob this huge bear hug. I respectfully moved about ten feet away as it was their own special moment. There was a lot of bonhomie. Paul called me over and said, ‘Bob is going to bring me on one more time and that will be great.’ Bob was delighted but also very daunted. He made the mistake, which is very Boblike, of going back to the Grapes. Unfortunately he drank too much and the word came over at seven o’clock that he just wasn’t up to it. Paul was genuinely disappointed as he could see it would have been really fitting.” Paul did give him a name check early in the concert. McCartney played a storming set, backed by the band from his album of rock’n’roll covers, Run Devil Run: that is, Pink Floyd’s Dave Gilmour and Deep Purple’s Ian Paice plus Mick Green and Pete Wingfield. They performed thiteen songs in 40 minutes and only one song from the Beatles repertoire, “I Saw Her Standing There”. His version of Ricky Nelson’s “Lonesome Town” was prefaced with the words, “This is dedicated to loved ones: past, present and future”, the sole reference to Linda. As well as the audience in the Cavern itself, thousands of fans gathered on Chevasse Park in the city centre to watch it on a huge screen: brave people as it was a bitterly cold night. The concert had the world’s largest netcast up to that point and it was also broadcast on BBC Radio One and, the following night, on television. The concert was a huge success and was subsequently issued on DVD as Paul McCartney Live At The Cavern Club. The event marked a turning point in McCartney’s relationship with the city. Perhaps because of LIPA, perhaps because of his family connections, perhaps because of the Cavern, McCartney has become more and more interested in the city. He includes Liverpool in whatever he is doing: performances at King’s Dock, Liverpool Cathedral for his Liverpool Oratorio, the Everyman for his poetry, the Philharmonic Hall for his tribute to Linda, and the Walker Art Gallery for his art. McCartney has become more at ease with his back catalogue and since the mid-eighties, has increasingly included more Beatle songs in his sets: now his live concerts can be as high as two-thirds Beatles.